Through commitment and contributions of time and resources, Team Jamaica Bickle is marking its 25th anniversary of caring for the health, well-being, accommodations and appetites of Jamaican scholastic track-and-field athletes participating in the Penn Relays in Philadelphia. Team Jamaica Bickle’s volunteer sponsors and supporters will be holding events and activities leading up to the 125th annual event April 25 through 27 at the University of Pennsylvania’s Franklin Field. Thousands of fans from the New York area will be trekking to the track meet. “It had become apparent that our student athletes had unmet needs,” Team Jamaica Bickle founder and CEO Irwine Clare said at the group’s 2019 kickoff reception at the Jamaica Consulate in Manhattan on Jan. 8, noting that the idea for a hospitality effort was inspired by the late Ben Francis, former principal of Vere Technical High School in Jamaica. “We incorporated the community to be there like all families should be; to provide warm meals, comfortable accommodations, reliable and safe transportation and medical care in an organized and sustained manner,” said Clare, looking back at the hospitality initiative’s humble beginnings and expressing thanks to many supporters, including Vincent HoSang, chairman/president of Caribbean Food Delights. “Vincent HoSang, with his Royal Caribbean/Caribbean Food Delights brand, came onboard immediately and later incorporated the Vincent HoSang Family Foundation, and has been with us ever since as partner playing a key role in the feeding of our athletes,” Clare said. The feeding of familiar Caribbean meals was a key component of the organization’s efforts and its name — “bickle” — means food in Jamaican dialect. 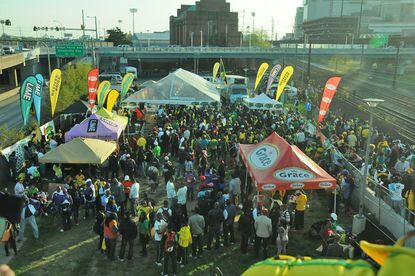 “It’s been some journey, one of remarkable achievements and the building of unbreakable bonds, friendships and partnerships,” Clare said, mentioning Grace Foods, the international Jamaican food and beverage firm which is now a major Penn Relays sponsor; Capital & Credit Merchant Bank, Team Jamaica Bickle’s first Jamaican sponsor; Western Union; Grace Kennedy Remittance Services; Tower Isle Patties; Transcontinental Shipping; Dennis Shipping; the Union of Jamaican Alumni Associations (USA), and other supporters. Over the years, Team Jamaica Bickle has expanded its goals by providing lifesaving medical defibrillators to high schools in Jamaica. In addition to assisting the stellar athletic achievements, the organization has stressed the economic impact of Caribbean fans at the Penn Relays. And the Jamaican successes are infectious — inspiring Trinidad and Tobago, Grenada, Guyana, the U.S. Virgin Islands, Barbados and others from the Caribbean to regularly send athletes to the Philadelphia meet. For Penn Relays tickets, visit www.pennrelays.com, and for more on Team Jamaica Bickle, visit www.teamjamaicabickle.org.